The Battle of Hamich Ridge, 2nd Battalion, 47th Inf.Rgt., 9th Inf. Div. Interview with Lt. Col. Lewis E. Maness, CO, 2d Bn., 47th Inf. At the start of the operation, on 16 November, the 2d Bn, was in position 1/2 mile southwest of SCHEVENHÜTTE (005420). The companies were all not quite up to strength — about 140-150 men per company — but this had no tactical effect upon their performance. Companies were habitually rotated, in order to give them sufficient rest in reserve. The terrain for the operation was flat and open, with only a few small hills which allowed a man to get in defilade if close enough to the ground, to avoid small arms fire. The ground was good for the operation of tanks, with the exception of several boggy spots, notably to the left of the road into HÜCHELN (000475). Open beet fields were the chief characteristic of the ground over which the 2d Bn. operated. 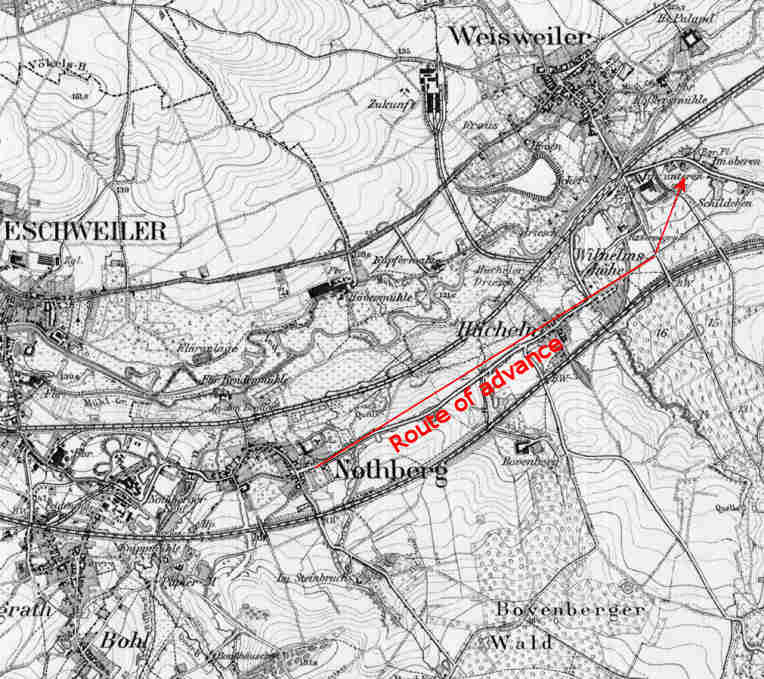 Most of the action occurred between two parallel sets of railroad tracks in a 500-yard wide strip of ground running generally east and northeast in an area south of ESCHWEILER and WEISWEILER as far east as LANGERWEHE. All of this territory was under enemy observation. "And he could hit the rails at any spot with his artillery," added Col. Maness. On D-Day, 16 November, the 2d Bn, marched to the positions on the southern and eastern edges of KREWINKEL (980410) vacated by the 1st Bn. when the latter attacked GRESSENICH. Only a small amount of artillery was received, and these moves were completed on 17 November. The following day, enemy air was active, and strafing planes riddled the kitchen equipment of G Co. with anti-personnel bombs, but caused no casualties. For the next few days until 23 November, the 2d Bn. remained in regimental reserve in the same position. On that day, the battalion moved north through GRESSENICH, HASTENRATH (975446), VOLKENRATH (977454) and BOHL (974456), then cut northeast to NOTHBERG (980460). The move started at 0500, and the battalion received no opposition until approximately daylight when, upon entering NOTHBERG, the enemy apparently observed the troops coming in and delivered several artillery concentrations which interdicted key crossroads in town. The move was made in a column of companies, with the tanks and TDs following behind the riflemen. 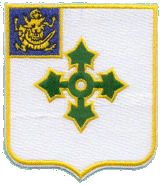 On 24 November, the 2d Bn. attacked at 1000 between the two railroad tracks, with HÜCHELN the objective. The plan contemplated that elements of the 3d Armored Division attack in this direction at 1300 should the 2d Bn. be unable to reach HÜCHELN. The railroad tracks on the south side of the battalion sector of advance were built up slightly; those on the north side were low and level. Neither furnished any protection, but were invitations for enemy observation coming from high ground in the town of HÜCHELN and a high slag-pile at (998482). On the ground which the 2d Bn. had to cover, there was a gentle slope from right down to left (south to north). Instructions from higher headquarters specified that the battalion stop and dig in if the resistance was too heavy. "I don't want you to get involved in a big fight; keep casualties down," were regiment's instructions to Col. Maness. Col. Maness noted that "you can't dig in and get protection in an open field." The battalion sent out several patrols along the right railroad tracks and between the left railroad tracks and the road which bisects the battalion sector, but the patrols spotted nothing and there was no indication of the numbers, disposition and defenses of the enemy prior to the jump-off. The 81mm mortars fired from NOTHBERG, and TDs delivered supporting fire for the attack from a small rise in NOTHBERG. 8 heavy machine guns were also set up to fire from NOTHBERG. 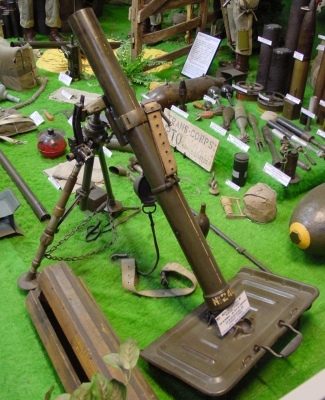 A ten-minute artillery preparation was placed on HÜCHELN, and as this lifted 300 rounds of 81mm mortar and HE and 100 rounds of smoke on the area of advance were to precede the attack. Col. Maness says that he would have executed the attack differently if he had known more about the enemy defenses. No aerial photographs were available in advance of the operation, but Col. Maness states that an aerial he subsequently saw in the possession of the 3d Armored Division showed clearly where the enemy defenses were located; it also indicated that the enemy positions had been misjudged by about 400 yards and that most of the supporting fire had dropped beyond his main entrenchments. The enemy had constructed a powerfully-manned system of zigzag trenches between the two sets of railroad tracks. He was using a good grade of fighting troops from the 12th Division, with a few paratroopers mixed in. None of them appeared to be trigger-happy, and they were well-dlsciplined, allowing the 2d Bn. men to advance to within 40 yards before opening fire. As a result, the first five men in F Co. were killed at the first burst of enemy fire. The battalion advanced with companies abreast, with one on each side of the road which cuts through the center of the sector. Attached tanks fired into what they thought were enemy positions, but could not use their machine guns very effectively when not right up with the infantry at points where the infantry could designate targets. The tanks did an effective piece of work on a red house at (996470) which the enemy was using as an OP; at one point in the operation, eight men were observed to enter the house, and after the tanks finished working it over, one German crawled out. One enemy tank at the railroad junction south of the slag pile (999478) caused our advancing infantry a great deal of woe until the fields across which the infantry was advancing were effectively smoked with the 81mm mortars. Problems of battalion-company communication complicated the battle for HÜCHELN. Although Col. Maness, in his forward OP in the last house on the eastern edge of NOTHBERG, was only 500-600 yards from his troops, he could not get to them nor their company commanders back to him. Artillery knocked out F Co's SCR 300's and the E Co, commander was pinned in his hole by artillery fire. Col. Maness sent the company executive officer, Lt. Lawrence J. McLaughlin of F Co., and Lt. Harry W. Kenny of E Co. forward to reestablish contact. The company executive officers had been with Col. Maness in the forward battalion O.P. At 1430, a battalion of tanks from the 3d Armored Division arrived in NOTHBERG. It was then planned to push the tanks down the main rood toward HÜCHELN up to the outskirts, then have them deploy and enter the town from all sides, with the infantry following to clean out the town. The plan was then for the tanks to push through WILHEMSHÖHE and northeast towards LANGERWEHE, with a company of infantry mounting a company of tanks to take FRENZERBURG castle. The advance into HÜCHELN was slowed by minefields in the road and on both sides of the road, and continued strong resistance from enemy dug in around the built-up area, and from the woods southeast of HÜCHELN. Marshy ground to the left of the road bogged down several of the tanks; one was hit by a mine and burned south of HÜCHELN. Several self-propelled guns firing from the north railroad tracks were knocked out by the tanks, but because of the mines and bad ground only one company of mediums could actually enter HÜCHELN. This they did shortly after dark and the town was cleared by 2100 after house-to-house fighting. The town was actually entered by F Co. pushing into the left edge, and then E Co. entering the same way through F Co's sector. Over 100 PWs were captured in HÜCHELN. 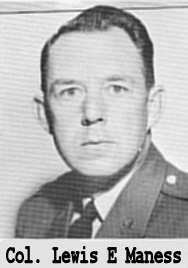 "Had I known that the enemy was dug in so well in that area," commented Col. Maness, "I would not have disposed my companies abreast during the attack, but rather would have used a column of companies and than sent one on a right hook through BOVENBERG through the 3d Bn's sector." At a company commanders' meeting in HÜCHELN on the night of the 24th, Col. Maness outlined the plan of advance for the following day: (G Co., up until than the reserve company, would pass through F and become the left assault company, F reverting to reserve and E remaining the right ausault company. G Co. was assigned to clear the built-up factory areas in WILHEMSHÖHE, while E was to cross open ground along the main road to LANGERWEHE. In preparation for the next day's attack, the tankers winched their bogged-down vehicles out of the marsh and the engineers cleared for mines all around and out of HÜCHELN. Col. Maness told the tank task force commander that he would clean the factory area as far as the LANGERWEHE road, because panzerfausts in the factory buildings were a particular menace to the advancing tanks. The battalion attacked at 0830 on 25 November. G Co. received a great deal of self-propelled gunfire on the left flank while pushing toward the road running south from WEISWEILER. E Co., on the right, was engaged in house-to-house fighting in order to break out to the open ground. "WILHELMSHÖHE took practically all day to clear." said Col. Maness. "At 1400 the brass were on me to get moving, so I pushed E Co. onto an open field beyond WILHELMSHOHE." Intense mortar and artillery fire greeted G Co. in the field, and three accompanying tanks of the 3d. Armored Division were knocked out. Cross-fire from machine guns, tanks and anti-tank guns soon pinned down the troops attempting to cross this area, and E Co. suffered 10 killed and 15 woundod. The area was smoked to enable E Co. to pull back to the protection of buildings in WILHELMSHÖHE, and F Co. was then committed around the left flank of the battalion sector. That night the battalion pushed out as far as IM UNTEREN SCHILDCHEN (005483). Special thanks to Albert Trostorf for providing me the above document.